Over the years I've found that the more active you are the more protein you need in your diet both to help you build muscle and to provide you with the energy to perform at your best. According to research, eating a diet high in protein can also help manage obesity, diabetes and osteoporosis. Protein rich foods like eggs, almonds, chicken, and fish are all great options for those living an active lifestyle like myself. Another way to meet your daily protein goals is the use of a protein powder/shakes. 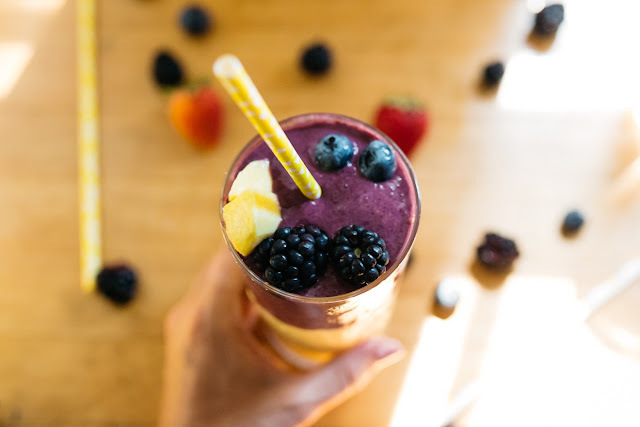 Protein in the form of shakes, like Premier Protein banana and cream or their more traditional vanilla & chocolate, can be eaten alone or combined with your favorite fruits to make delicious smoothies like the one below. Premier protein shakes have 30 grams of protein and are only 160 calories. For those of you that shop at Costco they are currently offering (8/3-8/17) $5 off an 18-pack of Premier Protein Shakes. Grab some and give the recipe below a try before your next workout. Place all mango smoothie ingredients into blender. Blend until smooth and pour into glass. Place berry ingredients into blender and blend until smooth. Pour berry layer on top of mango smoothie. Enjoy! This is a sponsored conversation written by me on behalf of Premier Protein . The opinions and text are all mine. I start most days with a shake myself. Love the color and the extra protein in this shake. I love all kinds of smoothies, this one sounds terrific! Smoothies are one of my favourite breakfasts. That mango smoothie sounds delicious! That berry smoothie is so pretty! These sound delish! Looks delicious! What a gorgeous presentation too! This looks amazing! Love adding frozen to smoothies too! I don't get nearly enough protein so I'm all over this! This would be perfect for me to have in the mornings for breakfast! I've never met a mango food I didn't love! Haha! This smoothie sounds delicious! I love this recipe - I have a Costco trip planned next week - will have to check out Premier Protein! This smoothie sounds delicious! I love the mango, banana, orange version. what a great combination of flavors - wouldn't mind this ever! Protein shakes full you up and love the fruit in these. Now which to choose to make first?! I make smoothies all the time and really need to start adding protein powder to them. This sounds delicious!